Happy Tuesday!! I hope you are having a great day. I created another Mother's Day card. 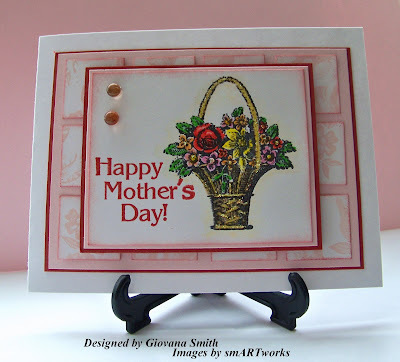 For this card I used 2 smARTworks sets; one is Basket and FS-Frames. I started my card folding a piece of 4 1/4" x 8 1/2" piece of CS. I stamped the long image on 1 side 3 times in different directions. I also stamped the little image and cut it out. The sentiment was stamped in Whisper White CS using Riding Hood Red Ink, I also stamped the small image as a BG in my sentiment. 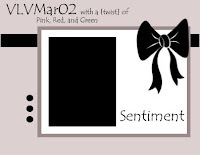 The sentiment panel is 2" x 2 1/2". I stitched a piece of riding Hood Red with Pink thread. I added a small pearl on the small image and also at the bottom. Final size card: 4 1/4" x 4 1/2". Card Stock: Pink ( Bazzill), Riding Hood Red, Whisper White. Stamps: FS-Frames and Basket by smARTworks. Ink: Riding Hood Red, Pretty in Pink. Accessories: Sewing machine, Pink thread, SU Dimensional, stamp-a-majig. Hello again my friends, I just finished editing my pictures so now I want to show a couple of the cards I made last weekend. Happy Birthday: This is a brand new set released just few weeks ago, it's called FS-Frames, I stamped the frame in Real Red, the small frame was stamped in Certainly Celery and the sentiment in Stazon Black. I stitched Whisper White and DP Bella Rose together. I attached the Green Satin Ribbon around and added 3 buttons. Ink: Read Red, Certainly Celery, Stazon Black. Embellishments: Offray Green Satin Ribbon, Assorted buttons. Accessories: Mini glue dots, 3D foam EK-Success, Scissors, Sewing machine, Pink thread. 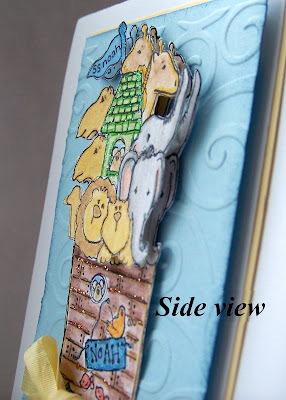 Noah's Ark: I created this card for a Baby shower. The card didn't end up as I envisioned it, but I like it. I will try again this Noah's Ark set, I have created some sketches for this set!! For this card I stamped the image twice, colored them with Watercolores pencils, watercolored crayons and Markers, then I cut out the top part and postioned on top of the other image. I added some tiny buttons on the bottom corner. Card Stock: Whisper White, Barely Banana, Light blue. Stamps: Noah's Ark Set by smARTworks. 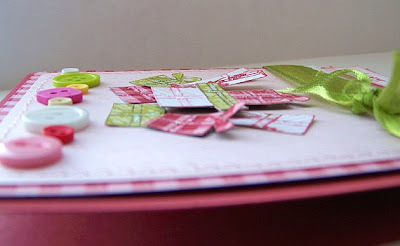 Embellishmets: Martha stewart Ribbon, Assorted Mini buttons. Accessories: 3D foam by EK-Success, mini glue dots, Watercolor pencils, Watercolored crayons, Markers, Cuttlebug, embossing folder. Tomorrow I have anotherMother's Day card for you. Hello everyone, are you having a good day?? I hope so. I have been very busy lately, just after I took my few days off, my husband broke his toe, he thought he would be fine, but it wasn't the case, day after that he went to the doctor and it wasa confirmation of a broken toe in 3 parts, like a butterfly , auchhh!!! he has been home since then (tomorrow 2 weeks) and he is back to work tomorrow morning. His toe still not good, I touched it yesterday and I could feel the broken part, not a good feeling. Then after that I had a Birthday party for DD and DH, everything was great!! We had few people coming over and celebrating the brithdays with us. DD had a lot of fun and ended up so exhausted she feel asleep on the couch, it was kind of cute to see her there, of course I took a picture, great for a scrapbook page, hmmm I don't scrapbook, LOL. I have created few cards that I haven't taken pictures yet, why??? because my right hand has been inflamated, well not my whole hand, just my middle finger, the pain was really intense. I cut a couple of images and afterthat I started having the pain, I am a right hand person, so it has been really difficult to do my stuff around the house and also create!! I will be back with some projects to show. I hope you come back. Hello everyone, I hope you are having a great day. 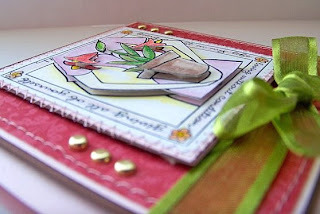 Today I want to show a card I made few days ago with my new smARTworks stamps. This set is called FS-Frames and includes 27 stamps between images and sentiments. 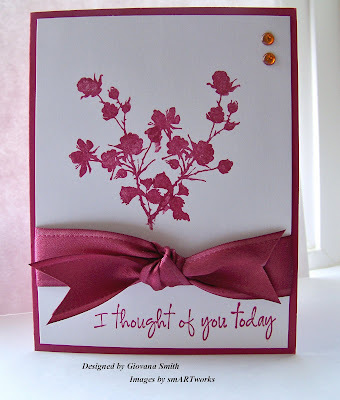 For this card I used one image, I think this one it is so pretty that I can use and use many times!! For my card I stamped the image first on my stamp-a-ma-jig, then I continued to stamp my CS so I could create my Background piece. I added a little bit of Copper Stickles in the center of each image. 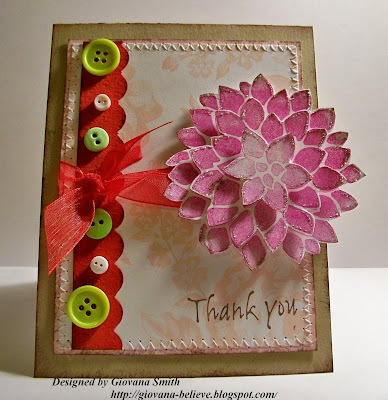 Then I stamped the circle from FRM-Trio Set and then the sentiment inside. I cut it out and positioned on top of BG using Big Zots. Card Stock: White, Riding Hood Red. Stamps: FS-Frames and FRM-Trio by smARTworks. Accessories: Zots, Mini glue dots, CooperStickles, stamp-a-majig. Hello everyone, it is Thursday and time for another MDC Challenge!! This time our challenge was to create an Easter or Spring card using Yellow, Lt. Blue and Black, so this is what I created for you. The cute image is Chick with Eggs by Serendipity, it was stamped in Black Ink. I colored the image with Watercolored pencils, Markers for highlights and Stickles Waterfall for the Blue Egg and Copper for the little eggs. On my second panel I used Lovebirds Forget Me Not Paper, this paper is very pretty, shimmer and glossy. Finally I used a piece of May Art Ribbon as my final touch, I added a palid yellow button. My card is 5" x 5" square. Card Stock: Baby Blue (Bazzill), Barely Banana, White. 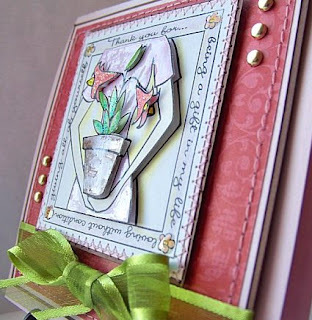 Paper: Loverbirds Forget Me Not. 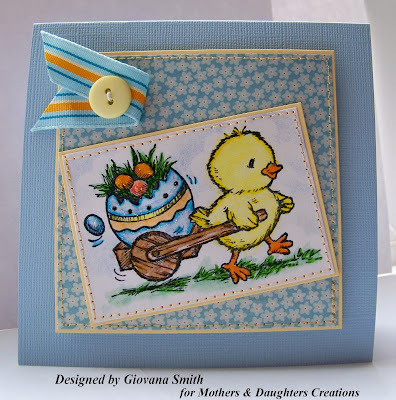 Stamps: Chick with Eggs by Serendipity. Accessories: Sewing machine, Yellow thread, White thread (for button), Dimensionals. I hope you like my creation, be sure you stop at MDC Challenge Blog to check the other DT member's creations and also play and have the chance to win some yummy prizes!! Hi everyone, I am back!! I have tons of things to tell you, but maybe later or in another post, right now I want to show you the cards I made for today's smARTworks Tea Party Challenge: Inches!! Donelda challenged us to use inchies in our projects, sorry last week I didn't post about the challenge, but here are my cards. To be honest I am not too good playing with inchies, maybe because they are too small, LOL. 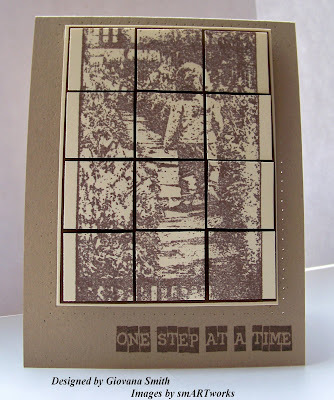 For my first card One Step at a time I used one of the new releases from smARTworks Journey. 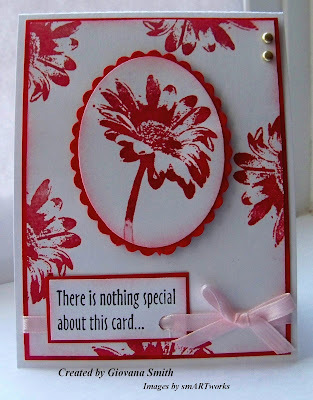 For this card I stamped the image in Basic Brown onto Vanilla Card stock. I cut the image 3" x 4" and then cut it in 1" square pieces. I positioned my inchies on Brown CS and then again on Vanilla CS. Then I paper pierced the around of the image on the Kraft CS. The sentiment was stamped in Basic Brown. Card stock: Kraft, Vanilla, Brown. Accessories: SU Dimensionals, Paper piercing set. 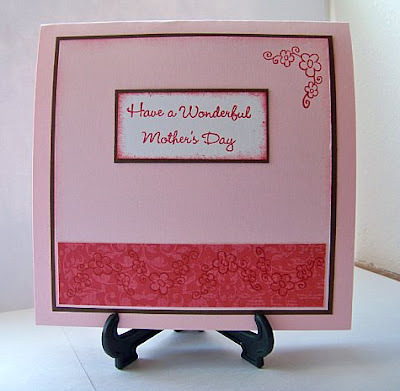 My second card is Happy Mother's Day, are you getting ready for Mother's Day?? I am!! I started already and here is one of my cards. This Basket set is really pretty, the basket is super cool to color. For this card my inchies are part of the background design. Every inchie was sponged in Riding Hood Red. 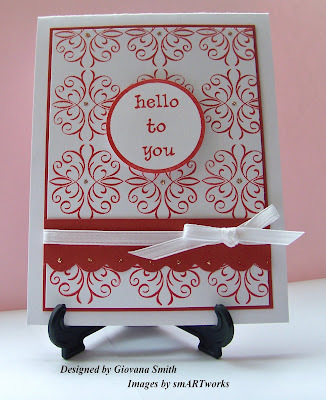 Card Stock: White, Riding Hood Red, Pink Pirouette. Ink: Stazon Black, Riding Hood Red. Accessories: Dimensionals, Mini glue dots, Water colored pencils, Markers, Gold Stickles, sponges. I hope you like my creations, now head over to Susan, Dina, Trish, Donna, and Donelda and enjoy their creations!!! Don't forget you can play along too!! You don't need to use smARTworks stamp, use any stamp you own and enjoy the fun with us. I'll be back in few days. Hello everyone, I hope you all are doing great. Sorry for the lack of posts lately. I've been busy and busier with house stuff, in addittion of that we are dealing with a mice situation, I am getting sick because of that, you may know I have asthma and any time I see one of those critters my asthma gets really bad, may sound funny but I am feeling sick right now. Tomorrow is DD 5th birthday and today she starts her swimming lessons, she is really excited about that. She is till coughing but nothing too bad. DH's birthday is this Saturday so I have planned at Birthday Party this Saturday to celebrate both birthdays. I hope you can come back in few days. Have a wonderful day and blessed day. Hello my friends!!! I am back with a couple of cards I made this afternoon, but first I want to wish my little sister a great and wonderful HAPPY BIRTHDAY!!!! I love you very much Natty and you know it. I was having a pretty nice and quite day today, listening my favorite music in Spanish, oh I was singing and singing loud and louder, so nice!!!!. DD is doing very well, still coughing but a lot better, she has been bouncing like crazy indication that she doesn't feel sick anymore, right? DH killed the ugly mouse yesterday, oh my I screamed like crazy when I saw it, maybe sounds funny, even I got an asthma attack, not funny at all. Anyway, the critter is dead and I hope I don't have to see more in my house anymore. I just wonder from where they come in, my house is new, we have been living here less than 2 years, oh well, I was saying about my quiet morning so I decided to navigate and check some blog out. I stopped at Kristina Werner's blog and Mojo Monday Blog and I decided to play these challenges. 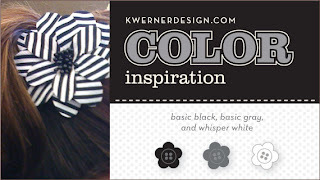 As you may know Kristina's challenge is a Color Challenge, this time: Black,White and Gray, fabulous combination and Mojo Monday is a Sketch Challenge. Kristina's Challenge: Can you believe this is the first time playing Kristina's color challenge?? I can't believe. I made the bow, added a clear button and add some very thin gray ribbon. 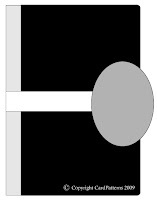 Card Stock: White (TPC), Black. Paper: gcd Studios Sophisticated Frost and Chianti Collection. 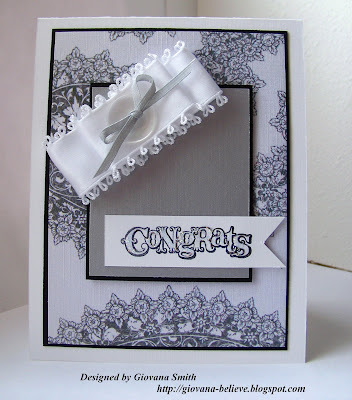 Embellishments: White Ribbon, Clear button, Offray Gray Ribbon. Accessories: SU Dimensionals, Zots Clear Dimensionals 3D, Diamond Stickles. 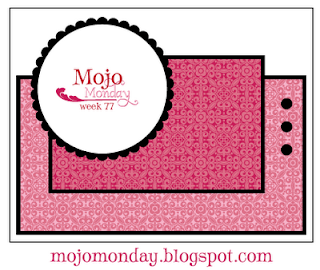 Mojo Monday: I based my card in Kristina's color challenge. I made the ribbon flower, I think I spent more time making it than creating the card. Card Stock: White (TPC), Black, Gray. 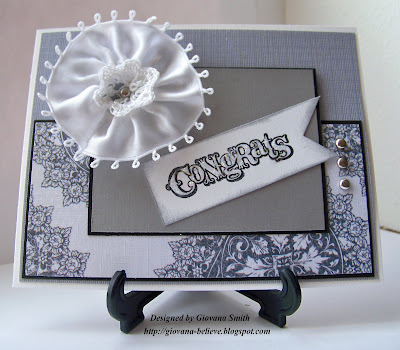 Ink: Stazon Black and Gray Craft. 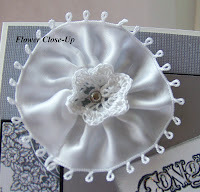 Embellishments: White Ribbon, Crochet flower, Silver brads. Accessories: 1/16 hole punch, Su Dimensionals, Diamond Stickles. Happy Saturday my friends!! I made this card few days ago, super quick and easy. I used one of the SU retired colors: Purely Pomegranate, aren't this color so pretty??? I used a stamps form Cookie Plate from smARTworks. 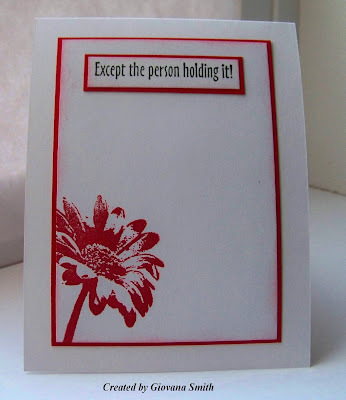 Card Stock: Purely Pomegranate, White. Stamp: Cookie Plate #1 by smARTworks. Hello everyone, today I played a lot with Kraft CS and I want so happy how my cards turned out. First, I want to thank all of you ladies that sent well wishes to my Becca. She was very happy to hear from you. Second, she is doing much better!!! Praise the Lord, still coughing, but no more fever and good nights of sleep (happy me). Yesterday, she took a veryyy long nap, almost 4 hours!!! I was concerned about her after 2 1/2 hours, I called her name and she told she wanted to sleep more, oh well I said, maybe 30 more minutes, nope noep nope, I had to go and let her know dinner was almost ready and she needed to get up. Of course after her long nap she didn't want to go to bed at regular time, but 9 pm I put her in bed even though she didn't want to, I think after 2 minutes she was done, LOL. She got up this morning at 7:30!!! this doesn't happen very often, she is up usually at 6:00 am. Anyway, today was one of those days! I woke up this morning and I found out I forgot to start my dishwasher, then I saw some little things on my pantry floor and I think we have a mouse again!!!! I freaked out, I really hate mouse/mice, they scare me, yes you can laugh. So I checked everywhere and started cleaning my house again (I usually clean house on Mondays), after a while Becca started jumping like crazy so I knew she was feeling muchhhhh better. Anyway, after all those things I decided I wanted to stamp, but I don't know why I wanted to use Kraft, LOL. I tried a card and I didn't like it, so I cut more and more paper and realized that I needed a plan, so I have tons of scraps on my desk looking at me telling they need to be use to. 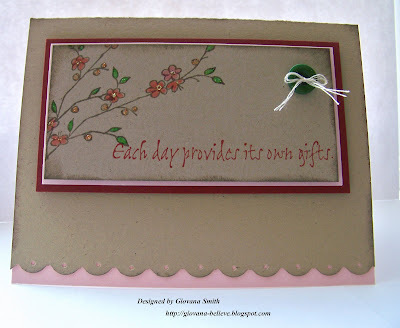 Each day provides its own gifts: Very simple card, I stamped the image twice onto my Kraft CS using Basic Brown Ink. The sentiment was stamped in Riding Hood Red. I used my Stamp-a-ma-jig to have a great position of image and sentiment. 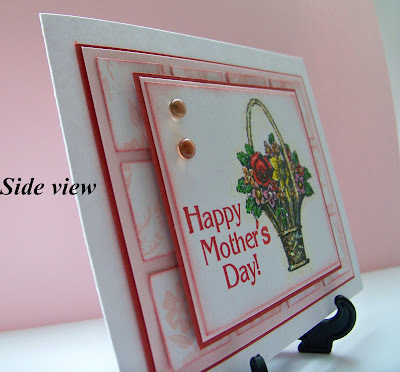 The bottom border was made with corner punch and a 1/16 hole punch. The image was colored with colored pencils and markers, then I added a little bit of Stickles. Stamps : SU Artfully Asian. Ink: Basic Brown, Riding Hood Red. Embellishments: Green button, DMC Embroidery thread. Accessories: Corner punch, 1/16 hole punch, Mini glue dots, SU Dimensionals, Stickles ( Gold, Diamond and Waterfall), Stam-a-ma-jig, sponges. 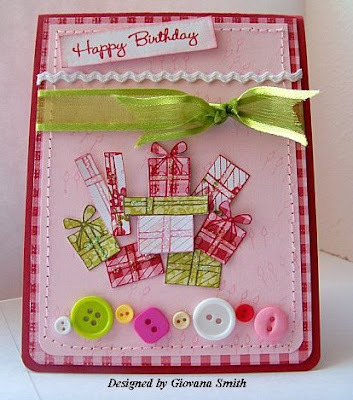 Happy Birthday: This card is super simple, easy to mass produce in minutes!!! Embellishmets : Offray Pink Ribbon. So happy for you: (Duo) Another super duper easy to make!! 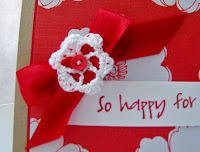 Do you like the pretty crochet flowers?? Aren't they adorable? My BFF Rossy made those for me!! How assemble my ribbon, first I made my bow, then I added the crochet flower and finally the tiny button, I hand stitched them together. Card Stock: Kraft, Red, White (Bazzill). Stamps: LOL by smARTworks . Embellishments: Offray Red Satin Ribbon, Offray Pink Sattin Ribbon, Crochet flowers, Mini buttons, thread, Accessories: Mini glue dots, White embossing powder, Embossing gun. Hello everyone, I hope you are doing great. I don't have a card for you today, my mojo took a trip to somewhere land, LOL. Tomorrow I promise to post something for you. In case you wonder how DD is doing today, well let me tell you, she slept all night, she is not coughing much, but still sick, she has had a couple of bad cough crisis and I felt the pain any time she was in the bathroom, poor baby. Yesterday I took her to the doctor, and her Dx is Upper Respiratory Infection, so she is taking antibiotics now and other medicines to relieve her coughing. Yesterday she run a fever all day, thank God she didn't today, so it is a big relieve for me. Have a great and healthy day. Good morning everyone, I am so sorry because I am very late posting my card. I set my post up for today, but it dissapeared, oh well, technology mistery. I didn't sleep well last night, DD is sick, she is coughing really bad, I think it is time to go to the doctor, the funny thing, well not too funny is that every year she is sick for her birthday, so she doesn't enjoy it much, ppor girl. Anyway, today is smARTworks Tea Party, our host this week is Dina and she challenged us to CASE each other. I had to CASE one of Peggy's creations, so I chose this card. I changed the image, the colors and kept the lay out as an inspiration. I would say it was a really hard decision just to choose one. 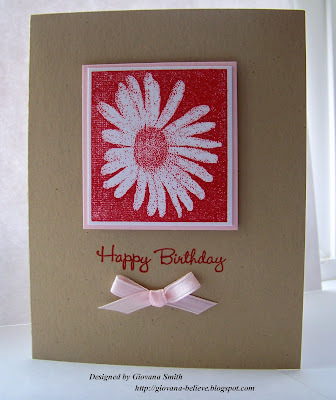 For my card I Stamped the daisies in Real Red, then I sponged the borders in Pretty in Pink. The sentiment was stamped in Stazon Black. I used scallop scissors for my oval. I added a couple of brads and Pink Ribbon. Ink: Real Red, Pretty in Pink, Stazon Black. Embellishments: Gold brads, Offray Pink RIbbon. Accessories: Coluzzle, Scallop Scissors (Provo Craft), SU Dimensionals, Sponges. I hope you can play along too, you don't need to use smARTworks stamps, but if you have them, ink them up!! 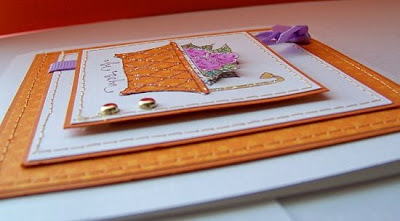 You can case any of the DT member's cards, you can see all our creations HERE. Now, head over to Susan (for Peggy's too), Dina, Donelda and Donna and enjoy all the CASEs. I am adding a Mr.Linky so you can post your creations!!! Hello everyone, I hope you all are having a great day. I am still sore form my last work out routine, but doing a lot better, at least I can walk,LOL. I am planning on doing a simple work out today. Today my DD woke up coughing really hard, I invited her to come to my bed and stay with me, sadly she had a really bad cough and my bed paid the price, (not details). Poor Becca, she is not feeling good at all, but she wants to go to AWANA tonight and also she wants a piece of Chocolate Pie, LOL, sometimes I am not sure if she really feels sick or not. Anyway, the other day I made this CAS card, but I forgot to post it here. I got the inspiration from a little add on the EVERYDAY Magazine!!. I used one of the pretty images from Cookie Plate#1 . 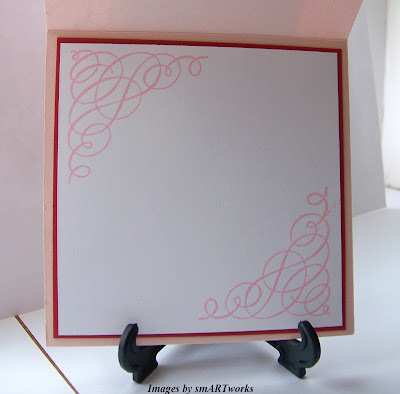 The image was heat embossed using White Craft Ink and White Embossing powder. The sentiment was stamped in Certainly Celery Ink. I added some lace ribbon and a couple of rhinestones, I sponges the borders with Mellow Moss Ink. Super quick and easy card. 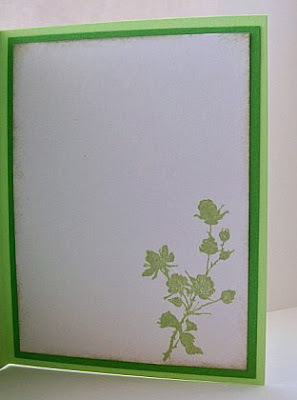 Card Stock: Gable Green, Glorious Green, White. 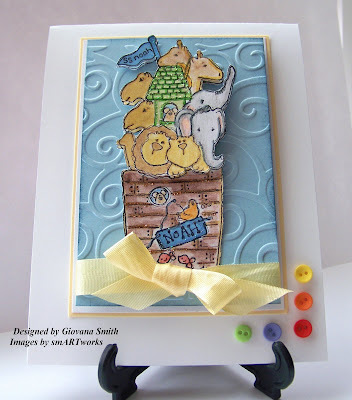 Stamps: Cookie Plate #1 by smARTworks. Ink: White Craft, Certainly Celery. Embellishments: Lace ribbon, MM Rhinestones. PS: I need a new keyboard, this is driving me crazy!!!! Hello my friends, I hope you are having a great day. 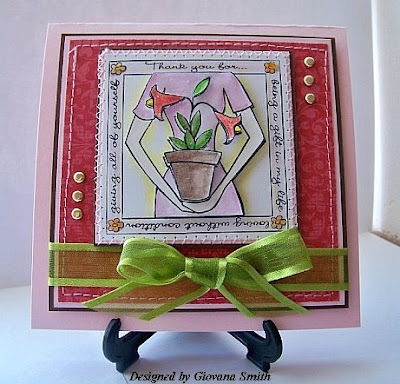 I want to show you a couple of card I made for Viva La Verve Challenges. Tend the Little Things: This was a sketch challenge with a twist of Buttons!!! I added just 1. Card Stock: Pink, Red, Black. Stamps: Cookie Plate by smARTworks. 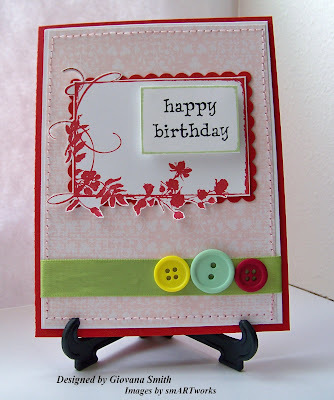 Embellishments: Offray Green Ribbon, Red Button. Accessories: Sewing machine, yellow thread, SU Dimensionals, Diamond Glaze. 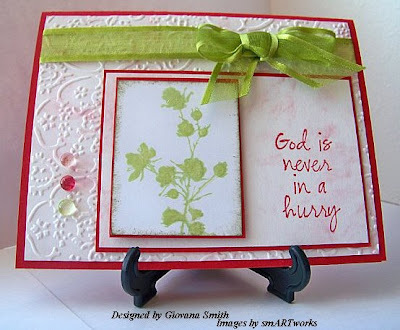 God is never in a hurry: This was asketch challenge and a color combo:Pink, Red and Green. I stamped the image in Certainly Celery, sponged with Mellow Moss. The sentiment was stamped in Real Red. I added 3 dew drops: Pink, Red and Green. Card Stock: Red, Pink, White. Stamps: Cooke Plate #1 by smARTworks. Ink: Certainly Celery, Mellow Moss, Real Red. Embellishments: Organdy Green Ribbon. Dew drops. Accessories: Cuttlebug, embossing folder, Diamond Glaze, sponges, SU Dimensionals. Hello everyone and Happy Sunday!! Did you remember to reset your clocks?? If you did, awesome!!! If you didn't like me, oh my!! Today we had to be earlier at church because DH had to run the sound boot, alas we were a little bit late. 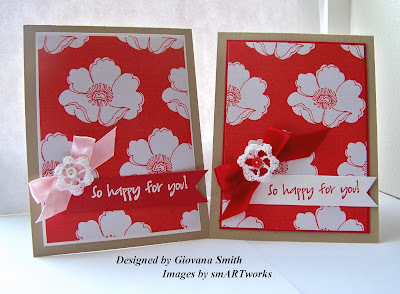 Anyway, I promised last Friday to show you more of my MFT cards, sorry for the delay. Yesterday, I started a new work out program and after a couple of hours my body was so sore I couldn't more, LOL. Today feels a lot worse, so tomorrow I have to work out the same routine to make my muscles stay firm. Anyway, back to my cards, MFT every month has Ambassador Challenges and Guest Designer Challenges, amazingly I played all the challenges. Ambassador Challenge #1: Create a Spring project without flowers. When I read this I said WHAT! !, this is going to be hard, but I created a long card that actually I didn't post because I didn't like it much, but I want to show it to you. Card Stock: Pink, Barely Banana, Red. Embellishments: Red Ribbon, Gold brads. 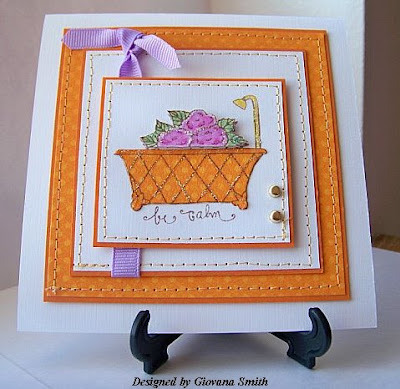 Ambassador Challenge #2: Create a project/card using Paper piecing, Pumpkin Pie and some Bling. 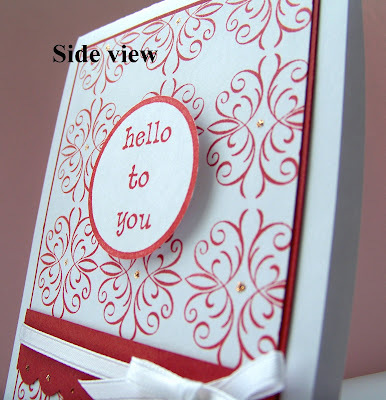 My card is very simple, it is a 5" square card. I paper pieced the bath tub and added some Diamond Stickles for the bling bling. I colored theflowers with Watercolored pencils and added some Dimensionals. Card Stock: White(bazzill), Pumpkin Pie. Embellshments: Grosgrain Lavender Ribbon, Gold brads. Accessories: Sewing machine, Yellow thread, SU Dimensionals, Circle Punch, Mini Glue dots, Watercolor pencils. 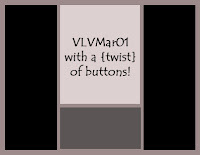 Guest Designer Challenge: This challenge was to use Buttons, buttons and more buttons!!! For my card I stamped the image in different pieces of SU Bella Rose DP,then cut them out and position them in different places. The little candles were stamped ramdonly in Pink PIrouette CS. I added different colors and sizes of buttons at the bottom. Stamps: MFT You Take the cake. Ink: Riding Hood Red, Mellow Moss, Pretty in Pink. Embellishments: Assorted buttons, Organdy Green Ribbon, White Ric Rac. Accessories: Mini Glue Dots, SU Dimesnionals, Sewing machine, Pink Thread, Corner Punch. My first picture is a real one, without editing, I can't find the edited one, my computer is crazy!!! and my keyboard too!! I want to be an IDOL!!! Yes!!! do not worry, I won't sing, LOL, well I do, but not very well. This is for MFT IDOL Contest! Have you checked the coolest contest on the MFT Forum on SCS??? I have and I love the idea. I have been thinking what to do and it was crazy!! I talked to my husband about and he smiled at me like are you too excited about to make a card?? Hello?? The prize is $250!!! I decided to give it a try and see how far I can go, I hope I can go very far, LOL. This is a 5"x 5" square card. I started with a Pirouette Pink base, then Brown, PP and Bella Rose DP, the base for my image is the same Brown, Pink. The image was stamped in Stazon Black. I did it 3 times. The first image is the bse, the second is the woman's body and the 3rd one is the flower pot and flowers. I colored the images with Watercolor pencils. Then I applied some Diamond Glaze to give it a shiny look, some Diamond Stickles were applied too. I added some Organdy Ribbon and Gold brads. I stitched the panels using Pink thread. 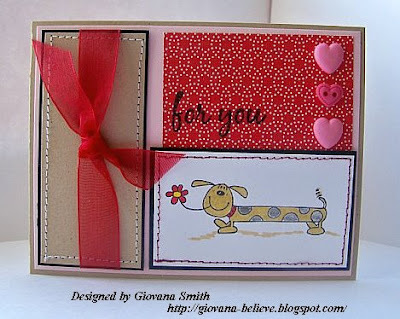 If you don't own any smARTworks stamps (yet), don't worry, use what you have, go to our Design Team gallery and find a project you like to case, then change at least 2 things (Color combo, embellishments, images, paper, etc), then post your creation here or in any of the DT member's blog. Hello everyone, I hope you are having a great day/night. I finally had some stamping time tonight, my last 3 posts were set up, so I haven't stamped since Tuesday. Last weekend I went to Olympia to visit my in-laws and DH picked up some tools, then we went to IKEA Seattle and bought few things for Becca's play room, in our way back home I starting having a really bad back pain, horrible!!!! Yesterday I was in pain almost all day, the pain medicine made my stomach upset, so I was miserable with pain after pain, argg. Today I am feeling a bit better, my back is a little bit sore but not too bad. Risht now we are having a really heavy rain and maybe snow in the next two days, oh crazy weather. 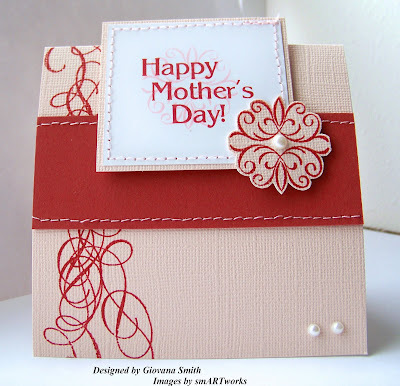 Card Stock: Kraft, Pink Pirouette, White (GP), Red. Ink: Basic Brown, Versacolor Peony. Stamps: SU Fabulous Flowers, SU Artfully Asian. Embellishments: Organdy Red Ribbon, Green and white buttons. Happy Sunday everyone! Can you believe we are already starting March??? In few days my DD and DH are going to celebrate their Birthdays!!! My baby is going to be 5 !!! She talks about her birthday since her last birthday, LOL. Anyway, here are my 2 other Wish Rak Cards, I love them!!!! Second Challenge: Include in your card a dog image. I received this image long time ago and it is perfect for this challenge. Card Stock: Kraft, Pink Pirouette, Black. Paper: GCD Studios Chianti Collection :Small Dots. 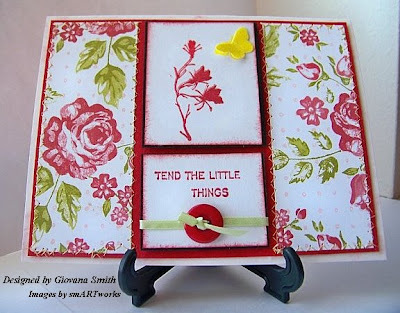 Stamps: Penny Black, Combo Sentiments by smARTworks. Embellishments: Organdy Ribbon, Heart buttons. Accessories: Sewing machine, Red and White thread, Mini glue dots, Markers, Colored pencils. 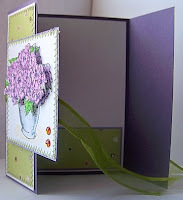 Third Challenge: Make a card using the Gate Fold Tutorial. This card made me think a lot, LOL, I changed papers more than twice!! but at the end I really like how this turned out. I received the image through the group. 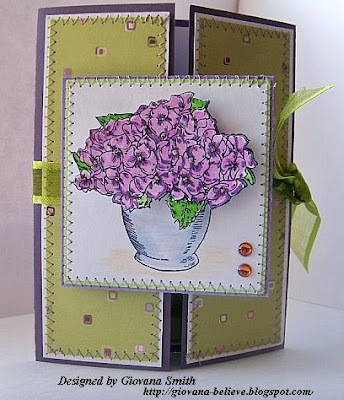 Card Stock: Elegant Eggplant, White. Paper: KI Memories: My Girl Glitter. 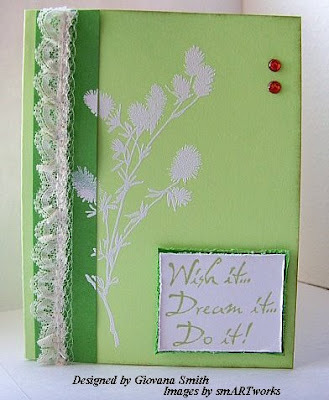 Embellishment: Organdy Green Ribbon, MM Rhinestones. Accessories: Sewing machine, Green thread, Markers, Watercolor Pencils, Diamond Glaze.